Why Is ‘Bad For Samsung’ Bad For Apple? Disclaimer: I continue to be on an AAPL bandwagon… sorry in advance! The article suggests that if Samsung is having mobile problems (particularly in emerging markets), maybe Apple could be, too? That’s certainly a reasonable suggestion. But, what the article doesn’t even contemplate is this: Maybe Apple is gaining marketshare? Wasn’t AAPL’s last quarter bolstered by some smart discounting in the emerging markets? Maybe that good trend is continuing? But from the bigger picture point-of-view: Does anyone really think the mobile business is slowing down? Like clothes and food and water, mobile is the one thing that everyone on the entire face of the planet really, truly might have to buy… and given the changing nature of technology, apparently buy over and over again. Except, unlike clothes and food and water, which you can buy from literally about a zillion companies… it feels like you can only buy mobile from two places right now: Apple and Samsung. So… when the CFO of Samsung says their quarter isn’t “look[ing] too good,” I kinda read that differently than Sam at The Motley Fool. What this suggests to me is that AAPL’s upcoming quarter might not be as “throw away” as a lot of people think. I believe AAPL has meandered downwards over the last few weeks exactly because of this type of erroneous thinking. If Apple, indeed, pulls another rabbit out of its hat (like it did last quarter), that could set up another potential earnings pop… unless, of course, AAPL starts climbing in anticipation of that beforehand. Either way, I think we’re higher by 5-10% after quarterly earnings than we are now ($91.98), especially after touching the $80’s last week. As I attempted to make the doom-and-gloom case for Apple stock at $91.28, I kept running into walls. I love the approach of this article, thank you. I’m most worried about upcoming earnings. Even though recent inventory checks seem bullish for the quarter, common sense tells me that people really may be waiting for the iPhone 6 (I am)… that’s gotta hurt on some level. On a macro level, I’m worried about a war breaking out… or oil spiking to $140… or some such… which, of course, would spook the entire market. I also worry that AAPL could shoot itself in the foot and make a dud product… Newton, anyone? Specifically Apple could underpower the iPhone 6 relative to Android devices… they seem to do that… and at some point that will catch up with them. I also think Apple made a user interface mistake taking away the “button” controls in iOS7… used to be easy to know what to tap… now it’s a bit more guesswork… the point is that Apple isn’t infallible and we may see things get more complex, not less… which could hurt adoption. Finally, I worry about contrarian things… everybody really is jumping on the bandwagon… you know it’s bad when even an author has to resort to a bear challenge! With all of that said, I can easily see — actually do see — the counters to all of these. Fewer iPhone 5’s sold could just as easily mean even more iPhone 6’s will be sold. In that contrarian way, a net positive. And Apple has already shown people a lot of iOS 8… and we know from the history of Apple laptops, Apple will figure out that smokin’ fast hardware will count in mobile, too. … it’s just hard to see — given that Apple is one of the top brands and cash machines in the entire world — AAPL *crawling* into simple p/e parity with the rest of S&P as being crazy. Just p/e parity alone represents about a 24% increase in stock price… or up to just under $115 a share. For a company that arguably is the most relevant in its growing space, does $115 feel so far from where we are? Not really. Imagine what AAPL can be worth if actually gets a multiple it deserves… ? Arg, I’m not sure I was very helpful to the bear case, sorry! I haven’t been a fan of the iWatch. Well, I mean, it’s not bad… I just didn’t see how it was going to move the needle. It’s not a “watch”… duh… but a wearable computer… duh again. My epiphany, though, was about why I would need a wearable computer: Because I’m currently wearing pants without pockets… which is forcing me to actually carry my smart phone in my hand with me… and place it vulnerably on a table in a public place… to keep it in earshot because I need to hear an upcoming meeting reminder alert. A wearable computer. No more carrying in hand. No more carrying bulgingly in a back pocket. No more fishing it out of a purse. 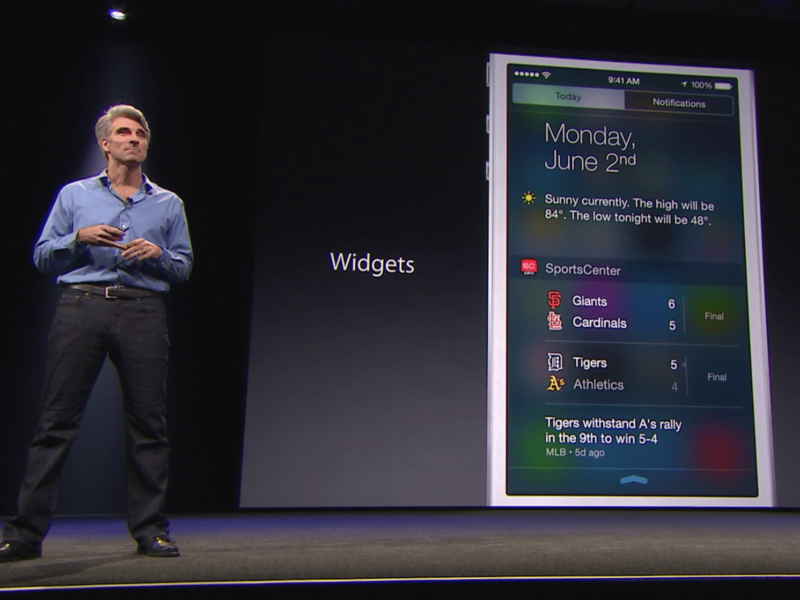 Did Apple Just Show Off The iPhone 6 At WWDC And No One Noticed? A picture from the keynote at the World Wide Developers Conference… this doesn’t look like any iPhone Apple currently sells… and I haven’t seen a single report commenting on this new chassis… which was followed by a screen of a real iPhone 5S a few moments later.